The Sky Between You and Me is a captivating and enlightening read. It can help teens, adults and parents become more aware of what it's like for a young person to live with an eating disorder. An emotional and heart wrenching novel about grief and striving for perfection. The Sky Between You and Me caught my interest because it deals with mental illness as well as the struggles of a teen girl dealing with friendship issues and the loss of her mother. This is the second book that I read in verse and once again I enjoyed it. It's like a heady mix of poetry and narrative. I was so caught up in the writing and the story that I raced through it. The Sky Between You and Me is the story of Raesha, a teen cowgirl who is on a Rodeo team and wants to compete at Nationals. Her mother died of cancer a few years back and she lives on her farm with her dad who is away a lot of the time purchasing cattle and taking care of their farm business. Dealing with her mother's absence, her desire to win so that she can honor her mother's memory, and the new girl in town Kierra who befriends both her best friend Asia and her boyfriend Cody, Raesha begins to eat less and less. She struggles with anorexia nervosa and loses respect for herself and blames herself for everything that is happening around her. As a mother of a teen girl, I truly felt for Raesha. She misses her mom and although she has a good relationship with her dad, he is away a lot and also dealing with the loss of his wife. It was heartbreaking to see her go into this downward spiral alone. Raesha is a teen girl in a lot of pain. The author captures the struggles and inner turmoil of Raesha so well, especially since the story is written from Raesha's point of view and by an author who has fought hard to recover from this eating disorder. At the beginning of the book we see a confident Raesha who loves the farm life, which is well described in this book (I'm a city girl through and through) and who loves her best-friend-since-childhood Asia and her strapping cowboy boyfriend Cody. But with the introduction of a new girl who seems perfect in every way, in looks and in cowgirl skill, Raesha's self-worth slips away and she becomes obsessed with losing weight so she can be lighter on her horse for the competition. As she becomes more sick, it seems that both Asia and Cody are too busy with their own stuff to really notice. I was so frustrated by their lack of caring. These were the two people closest to her and they didn't do anything! None of the adults seemed to notice either. Asia and Cody actually were not pleased with her for not liking Kierra, and their standoffish behaviour only served to make Raesha feel like it was her fault they were distant, which just spiralled her deeper into her illness. Cody wasn't much of a boyfriend. He treated her more like a brother at times, showing some signs of affection, but that's pretty much it. There wasn't much substance to their relationship except that they shared the love of rodeo sports. I would have liked for some acknowledgement from Asia and Cody that they could have done more to help Raesha. That they were sorry for not truly recognizing Raesha was ill. (Even though she was sickly thin, bruised easily, and fainted in school. Hello? Didn't it occur to them she could have had cancer? Or some other disease that was making her lose her appetite?) Yes, I get that teens can be selfish thinking mainly of themselves and perhaps not knowing enough about mental illness. But what about after learning that Reasha saw a doctor and was now in therapy? I don't want teens reading stories about mental illness thinking that it's okay to ignore blaring signs that their friend is ill. Even talking to a counsellor at school or an adult they trust about their concern for a friend would have been a start. This message has to come out in stories such as this one. 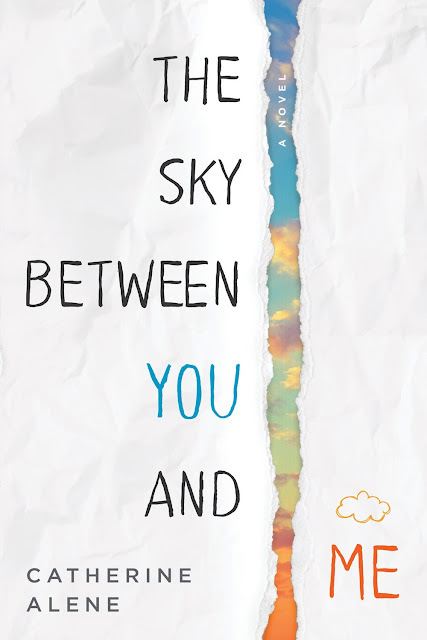 The Sky Between You and Me is a captivating and enlightening read. It can help teens, adults and parents become more aware of what it's like for a young person to live with an eating disorder. As a parent, it reminded me how important it is for me to keep telling my teen girl she is beautiful and worthy. Catherine Alene has an MA in teaching, and earned her MFA in writing at Vermont College of Fine Arts. 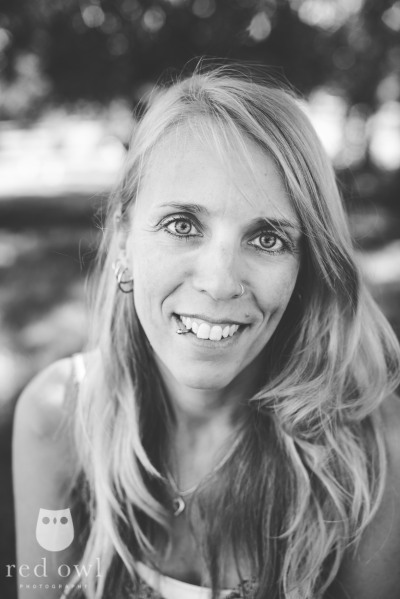 Like the protago­nist in The Sky Between You and Me, Catherine battled anorexia nervosa. Now in recovery, she is actively involved with the National Eating Disorders Association (NEDA) and regularly serves as a recovery speaker, talking to college students and professional groups about her experience living with, and finally recovering from, the disease. Catherine teaches language arts at an alternative high school in central Oregon, where she currently lives with her daughter, horse, cat, and black lab, Herman. I'm glad there are books like this out there now.